Cork Businesswomen Asked to Step-Up! As the deadline for entries for the Network Cork Businesswomen of the Year Awards draws nearer, Network Cork President Gillian Hennessy urges Cork women to put themselves forward for an award in 2019. 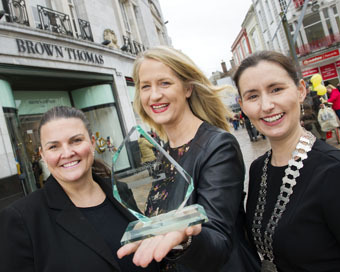 The call for entries comes as Brown Thomas are announced headline sponsor for the Network Cork Businesswomen of the Year Award Gala Dinner which will take place later this year. The deadline for award entries is Friday 5th April 2019. Speaking ahead of the upcoming awards, Network Cork President, Gillian Hennessy said: ‘Although we see numbers of entries increase every year, there is still huge scope across the categories for more businesswomen to enter or nominate a colleague. A stigma still exists around ambitious women who acknowledge their successes and we’re seeing a reluctance among women in Cork to put themselves forward for an award. Whether you’re a solopreneur or managing a team of 200 we strongly urge you complete the submission. There are 8 categories open for entry. Winners at a regional level will be put forward for consideration at the national awards. Pictured (l-r): Sian Horn, Network Cork Business Awards Co-ordinator; Miriam Flahive, Brown Thomas Cork (headline sponsor) and Gillian Hennessy, President of Network Cork.